Elloren Gardner and her friends were only seeking to right a few wrongs when they rescued a Selkie and freed a military dragon. The last thing they expected was to be thrust into a realm-wide underground resistance against Gardnerian conquest. While the Resistance struggles to fight back against the harsh rulings of the Mage Council, more and more Gardnerian soldiers descend upon the University…led by none other than Lukas Grey, now commander of the nearby military base. Though Elloren tries to keep him at arm's length, Lukas is determined to tie himself to her, still convinced that she is the heir to the power of the Black Witch, a legacy of magic that will decide the future of all Erthia. As his own magic calls out to her, seeking to awaken a dark force within, Elloren finds it more and more difficult to believe that she's truly powerless, as her uncle always claimed. Caught between her growing feelings for the rebellious Yvan Guriel and the seductive power offered by Lukas, Elloren must find a way to stay true to what she knows is right and protect everyone she loves…even if that means protecting them from herself. Welcome to the resistance. What a sequel! This book was just as dense as the first book but in a completely different way. Upon finally realizing how wrong the Gardnerian faith is, Elloren has decided that something needs to change. Since she doesn’t have the magic necessary to fight Vogel and most of the Gardnerians, she has to do things differently. Since Vogel is now in charge there has been many changes, mostly banning or killing anything that would oppose the Gardnerian’s beliefs. This book definitely had a darker tone than the first book. While Elloren moved past the prejudices set over the other races, her world is changing for the worst. I really liked how much more action was taken place in this book. I realized that the first book was more character and world building, which was done very well, but this book was more about action. There was a lot more depth to the changing world and you could feel the pressure that Elloren and her friends were under. Since they had to turn to others for help, we really get a bigger understanding of the other races in the book. I really enjoyed this aspect because it brought more depth to the story. One of the aspects I was a little disappointed with though was the lack of learning at the university. While Elloren and her friends were still at school, they weren’t attending classes? I say this as a question because I only remember one scene where they are doing schoolwork. They were basically taking these trips to other places in the world without being noticed that they weren’t present for classes. Besides this, I really enjoyed the build-up to the ending. I really did not see that coming and it is going to make an interesting third book. Elloren was still amazing. Her character had definitely grown a lot from book one. She is no longer immune to the prejudices that her people had put on other races but realizes that they have been wrong about how they treat others. The friendships formed in this book was amazing. I loved how they all banned together and support each other no matter how they were raised. My favorite scene was in the woods, right before everything went horribly wrong - of course. Their friendship really showed how much they enjoy each other’s company and took time to teach everyone a part of their own culture. I did think that the Elloren, Lukas, and Yvon triangle was a little dragged out. Forest tries to show a connection between Elloren and Lukas but it seems too forced. The attempt to be a love triangle was never felt concrete because of the true attraction between Elloren and Yvon and the lackluster connection with Lukas. I am excited to see how each character grows more in book three and how they will affect the war to come. 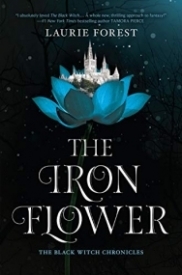 Overall, The Iron Flower by Laurie Forest was an amazing second installment to the series. There was still more world building as we were introduced thoroughly to some of the other races in the book, which was great. I really love the characters with how strong and close they are all becoming. The next book is definitely going to be epic and I cannot wait to continue the story. I highly recommend this book if you liked The Black Witch and enjoy dark fantasy. Holy Jesus! I did not see that twist coming! I still can't even fully process what just happened and I'm so upset that I have so long to read the next one. You can't just leave a girl hanging like that!!! Okay, let my try and reign myself in here. The Iron Flower, in my opinion, is even better than The Black Witch, it's still very very heavy handed in it's ideals and such but that's the whole point of this series and it's making it's point very well known. The characters are flushed out so well that I honestly feel like they could be real. Even the side characters are well developed. The first one was more about Ren overcoming what her people had always told her, seeing the other people as just that, people. This one leans more towards the romance (swoon Yven) and her helping the resistance. This book made me cry, laugh, pump my fist into he air, scream, and even at the end, blew my mind. The writing is fine, detailed wonderfully, the pace is also much better than the first, I don't feel there's any parts that drag. Overall, I can't wait to see what happens to Elloren next because she's got her plate full now.